Kokeshi dolls, the highly stylised Japanese wooden figure that has become one of the most collectible toys in Japan, dating back to their original conception in the early 19th century. Originally sold as souvenirs to the visitors of hot springs, or onsen as they're known in Japan, around the Tohoku region in Northern Japan, the Kokeshi doll has developed into a greatly admired art form, adopted by skilled craftsmen in the Tohuku region, as well as more recently in the Gunma prefecture. "The creative kokeshi doll has a more contemporary stylish design"
The kokeshi doll starts life as a carefully selected and seasoned piece of wood, most commonly taken from the mizuki or dark cherry tree, which is then skillfully shaped and cut on a lathe, usually in two separate pieces for the head and the body which are attached together, once shaped, using a wooden plug. 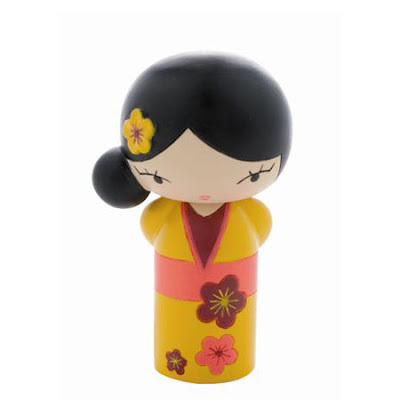 Once the desired shape has been achieved, the kokeshi craftsman polishes the doll to a high shine finish, before delicately painting on the characteristic facial features and stunning kimono designs.